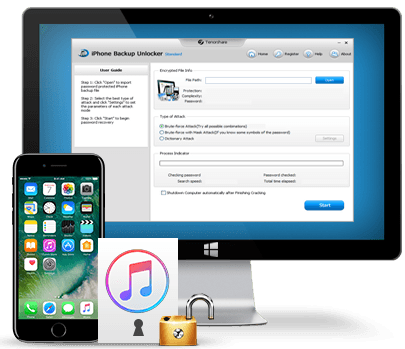 Unlock iTunes Backup File Password for iPhone, iPad and iPod Touch! • Work with iPhone X/8/8 Plus/7/7 Plus/SE/6s/6s Plus/6/6 Plus/5s/5c/5/4S/4, iPad Pro, iPad Air 2/iPad Air, iPad mini 4/3/2, iPad 4/3/2, iPod Touch 5/4, etc. • Be compatible with iTunes 12.7/12.6/12.3/12.2/12/11.4, iOS 11, iOS 10.3/10.2/10.1/10, iOS 9/8/7. iTunes prompts you the password you entered to unlock your iPhone backup was incorrect or unworking. Can't unlock iPhone backup? iBackupUnlocker is here to save you out from any encrypted iPhone backup password problems. Fully support iPhone X, iPhone 8, iPhone 8 Plus, iPhone 7, iPhone 7 Plus, iPhone SE, iPhone 6s, iPhone 6s Plus, iPhone 6, iPhone 6 Plus, iPhone 5s, iPhone 5c, iPhone 5, iPhone 4S, iPhone 4, iPhone 3GS, iPad Pro, iPad Air 2, iPad mini 3, iPad Air, iPad mini 2 (iPad mini with Retina Display), iPad 4, iPad mini, iPad 3, iPad 2, and iPod Touch (all generations) devices. Compatible with all versions of iTunes and iOS (including iOS 11/10.3/10.2/10.1/10/9/8/7). This powerful iOS backup unlocker offers 3 methods for you to decrypt iPhone backup encryption with 100% recovery rate. Brute-force Attack. If you forgot the password completely, this type of attack will try all possible characters combination randomly. Brute-force with Mask Attack. You can use this attack if you still remember part of your password. Such as password length, character set, etc. 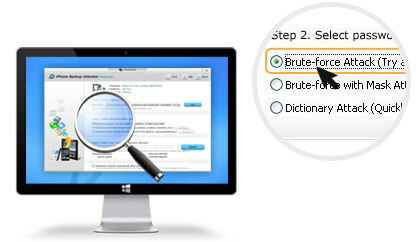 Dictionary Attack. This attack is intended to seek the possible password based on a dictionary. This dictionary can be the integrated one or the one you provide. 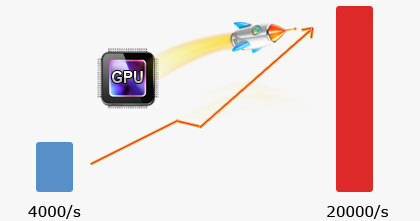 Providing a much faster speed in cracking iPhone backup password with GPU acceleration when one or several ATI or NVIDIA video cards are installed. 5x faster: Average decryption speed is 4000 password/second, with GPU acceleration the speed could reach to 20000 passwords/second. It is the easiest tool to hack iTunes backup, with which you can unlock iPhone, iPad and iPod touch backup password in iTunes with only 3 steps. Step 1: Import iPhone backup file. Step 2: Select a suitable attack type. Step 3: Start recovery and done! Choose the perfect iBackupUnlocker (iPhone Backup Unlocker) for You! Users of iBackupUnlocker Have Surpassed 840,000+ Worldwide. "The program did a great job. I just used it to delete password from my encrypted iTunes backup which iTunes didn't allow me to do. I will recommend it to anyone I know that need this kind of product."